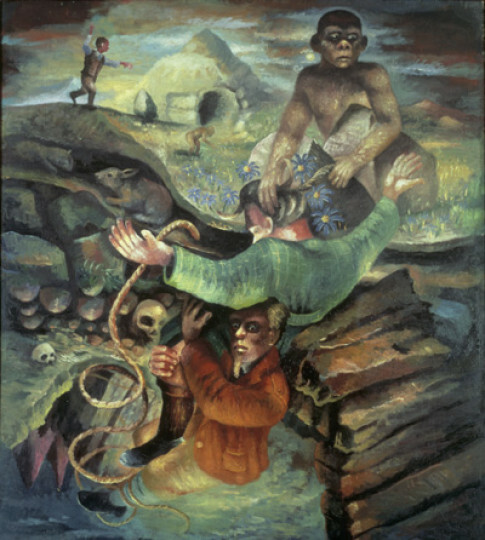 PAINTING ON A DARWINIAN THEME 1986 Steven Campbell (1953 – 2007)	© The Estate of Steven Campbell. Courtesy the artist. Steven Campbell was born in Glasgow. He spent seven years working in the steel-works as a fitter and maintenance engineer before going to Glasgow School of Art. After graduating he went on a Fulbright Scholarship to New York. His early work was in the field of installation and performance art, and elements of performance continued through into his painting. These works, and the one in the British Council Collection, were painted quickly as the artist improvised and changed ideas rapidly. The paintings were theatrical, and characters frequently absurd, as they posed and gestured often apparently oblivious of what was happening around them.